October 2, 2017 By Liz 64 Comments Note: This post may contain affiliate links. Fall is here which means I’ll soon be craving all sorts of comfort foods! Macaroni and cheese has always been one of my favorites, but it usually feels more like a “special occasion” dish. Maybe that’s because it’s usually loaded up with tons of cheese and butter without a lot of redeeming health benefits. I can’t justify having it for dinner every night, but sometimes a girl needs her macaroni. Am I right? That’s where this lighter broccoli macaroni and cheese comes in. So I played around with a traditional recipe, and switched some things up, namely adding broccoli and removing the massive amounts of butter. Ok, there were a few other changes, but read on for the full healthy baked macaroni and cheese recipe! 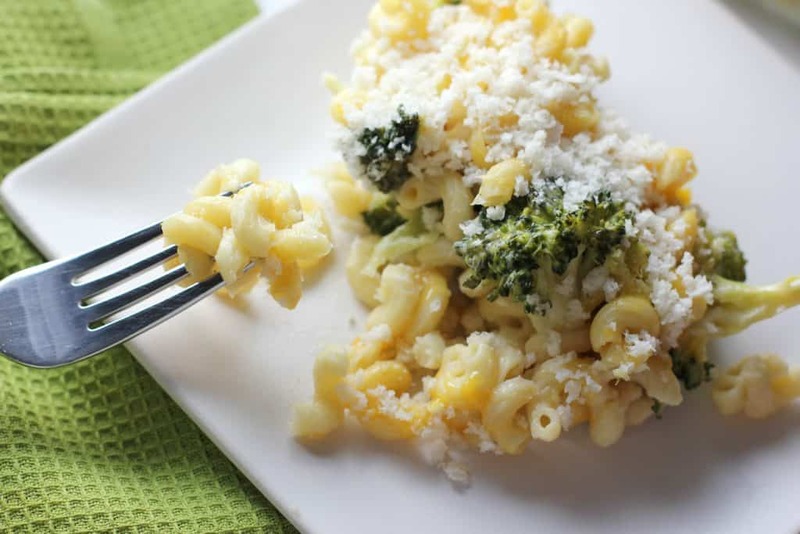 A healthier version of traditional macaroni and cheese. Add in the macaroni and cook according to the package directions. You can boil them together until both are tender. In a separate sauce pan, heat up the milk over medium heat. Right before it starts to simmer, whisk in the flour and cornstarch slowly and reduce heat to low. Slowly add in the cheeses until melted. You can turn the heat back up a bit if you need to. Sprinkle with garlic powder, salt, and pepper. Combine the sauce and the macaroni in an 8×8 pan. Cover with breadcrumbs and Parmesan cheese. Bake for another 10 minutes, or until the top begins to brown. I’ve been loving Banza chickpea noodles and I swear you can’t taste this difference in this recipe! If you can’t find them or you’re not a fan of chickpeas, whole wheat noodles will do the trick. If you’re short on time or you’re craving a really saucy macaroni and cheese, you can skip the baking part entirely and stop after step 9. You can also prep everything until step 9 a few hours or a day before. Keep it in the fridge, and plan to add an extra time while you bake it to ensure it gets hot all the way through. 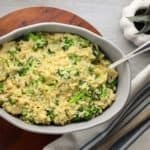 I’ve made this lighter broccoli macaroni and cheese for friends and roommates and I’ve even made it for our family’s Christmas dinner! It’s a perfect side dish or vegetarian main dish. 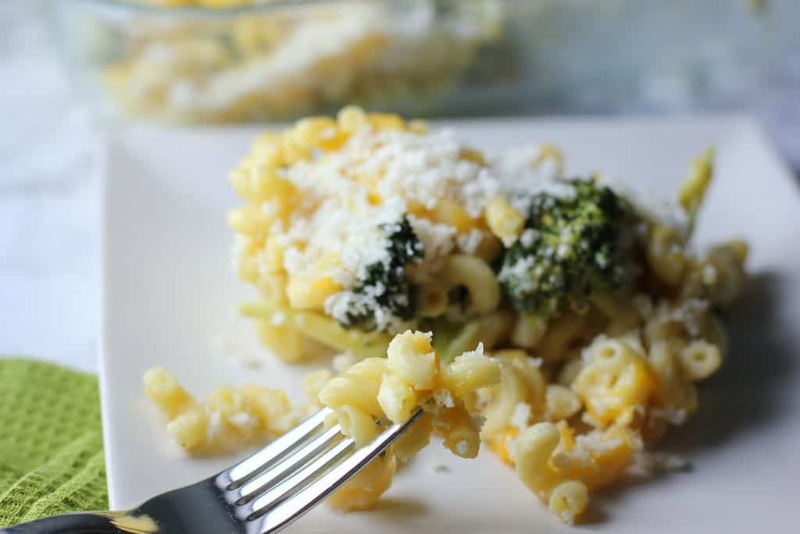 Macaroni and cheese has always been one of my favorite comfort foods and with a recipe like this, I don’t have to save it for special occasions! This post was originally published in January, 2014. Updated October 2017. Like old times! 🙂 Even though that Jeopardy was really hard….and I got hardly any…haha. That mac was good, though! we used to have spaghetti casserole growing up. I swear i could eat that whole thing too! LOL! probably reason why i have a GF intolerance. haha But thank goodness for GF pasta now! I love family dinners! We do family dinner every night at Andrew’s parent’s house and everyone comes plus their significant others. We usually play games and switch off hosting. I love mac n’ cheese, especially when it’s a little lighter so I don’t have to feel so bad about it. This looks seriously good! I’m sure you could leave it out! It just makes the sauce a little but thicker. You could even just add a little extra flour and you’d probably get the same result! That just looks and sounds delicious. Even better that it is pretty healthy? Count me in. Always. This looks really good 🙂 I wonder if I could get Marty to try it?? Yummm, this sounds delicious! Smoked gouda in it sounds delicious!! Plus I always love adding broccoli (or peas!) to my macaroni and cheese! Smoked Gouda is my favorite!! I bet peas would be a delicious addition! I made mac n’ cheese this week and lightened it up a bit by using almond milk and a little (very little) less cheese. I like the idea of bulking it up with veggies though. I think I may roast some of my favorites and add them to the pot next time. Great tip! Oh yum! I should try this with almond milk! Yummmm. Great recipe – can’t wait to try it! Oh man, I love Jeopardy but I haven’t watched it in forever! But anyway, yum! We usually make a broccoli pasta bake with ricotta and tomato sauce, but this is totally going on the menu for this week. Must get some gouda! We watch Jeopardy with dinner, too! Only our “family” dinner involves a Hunger Games level of competitiveness! Haha, we take it pretty seriously. i love sneaking in veggies to meals and i also love bulking pasta dishes up by using veggies and beans! We love homemade mac and cheese and are always throwing something in the mix. Broccoli is the best! Smoked gouda is my e’erythinggggggggg. Don’t think I’ve ever added it to mac n’ cheese – genius! This sounds so good. I love making mac n cheese too, but the cheese and fat always kills me. 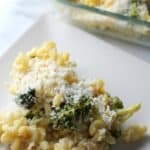 I already love broccoli and cheese so this has to be a winner! Yummy! to the long list of ways this water sport promotes better overall health. Scientists and Medical Practitioners are saying that ageing may be treatable and should not be inevitable. Have sunscreen always with you so you never get caught out. and creative solutions for contemporary business segments. fit both dry and oily skin is the water soluble cleanser. Menthol Crystals , Hydroxcitronellal , Methyl Ionone , *Limonene , *Linalool , FD&C Blue No. The typical regions are the eyes angels, between the eyes and the forehead. For more Informations Please visit our makeup cosmetics website. Foundations bases and powders – Lead based foundations (very toxic). oil blotting sheets and nail enamels etc. way to ensure the products you use are paraben-free is to check the ingredient list for any word containing “paraben. On the other hand, cosmetic testing on animals has become shrouded in controversy with animal rights’ activists vehemently opposed to it. market is much larger than the world’s GNP and even world trade. The value of one currency is converted into the value of another currency and this is called foreign exchange or forex. Modern forex trading systems have their unique mobile options. basic knowledge about worldwide economics and trade. Keep up the great work! You already know, lots of persons are hunting around for this information, you could aid them greatly. you made running a blog look easy. The entire look of your site is wonderful, as smartly as the content! Thanks ffor the auspicious writeup. It in truth used to be a enjoyment account it. Glance advanced to far brought agreeable frdom you! I pay a quick visit day-to-day a few web sites and information sites to read articles or reviews, however this webpage provides quality based content. This looks so good! I can’t wait to make it for my kids and I! I’m always looking for new and awesome mac and cheese recipes. This just went to the top of the list. I have been really into chickpea pasta lately! 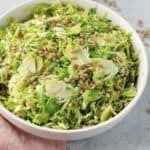 This looks so good, I bet I could even convince my kids to eat their broccoli! Making this for sure. Holy moly does this macaroni and cheese sound delicious! And I personally believe adding broccoli to anything with cheese makes it a winner! Pinning to make this week, thanks! I love packing out mac and cheese with vegetables. It’s total comfort food, but with a healthy kick. Yum! Exactly! You get all the cheesy goodness with a little extra nutritional boost! I thinks its about time I started adding veggies to my mac n cheese. This looks so delicious. Creamy and comforting. Just the recipe for fall. This is what I do all the time too! I love adding broccoli and cauliflower. Great recipe! We should be allowed to enjoy macaroni cheese some of the time, because it really is a great meal for the cooler nighs of Autumn. Tweeking a few things to take out the not so healthy bits is a great idea, and means it is still enjoyable, if not even more tasty. I’m loving everything about this! Love Banzo! Love broccoli! …and who doesn’t love mac n cheese! Yum! Accidentally hit send too soon! Mac and cheese isn’t a classic over here but I’m sure I would have happily eaten this had my mum served it to us when I was a child. Yum! Love mac & cheese! That looks seriously delicious! I’ve just added this to my list of receipes I must try! Yum! I’m the same as you, absolutely love my mac n cheese but on it’s own it’s more of an indulgence food. Love how you made this version lighter! I usually add cauliflower to mine but I can imagine broccoli would go well too! 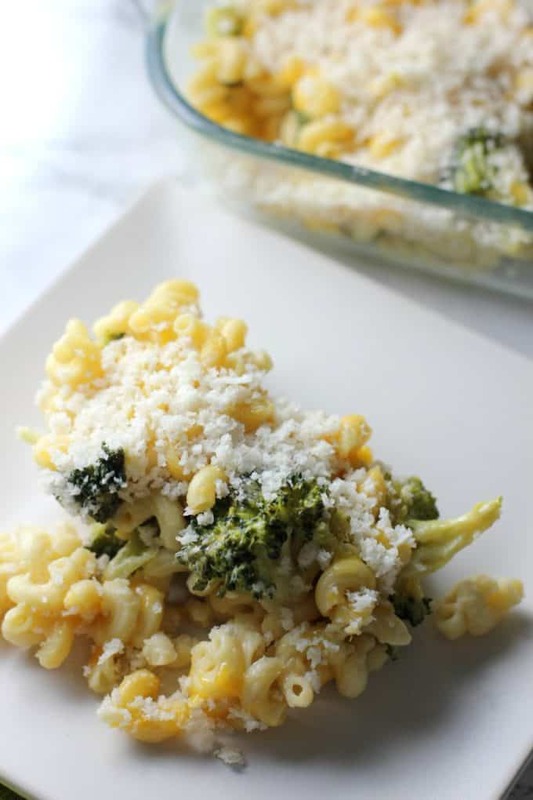 I love the addition of broccoli in this mac and cheese. Need to try this dish! Perfect comfort food! Love the additon of the broccoli!